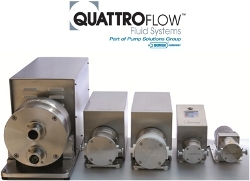 QuattroFlow Fluid Systems develops and manufactures specific biotech pumps for the critical application in the pharmaceutical and biotech industries. Whether in cross-flow systems, chromatography devices or centrifuges; the pump gently convey aqueous solutions and biological products sensitive to shear force ranging from blood to vaccines without denaturing them. Unique four diaphragm pumping system. FDA & USP Class VI elastomers.